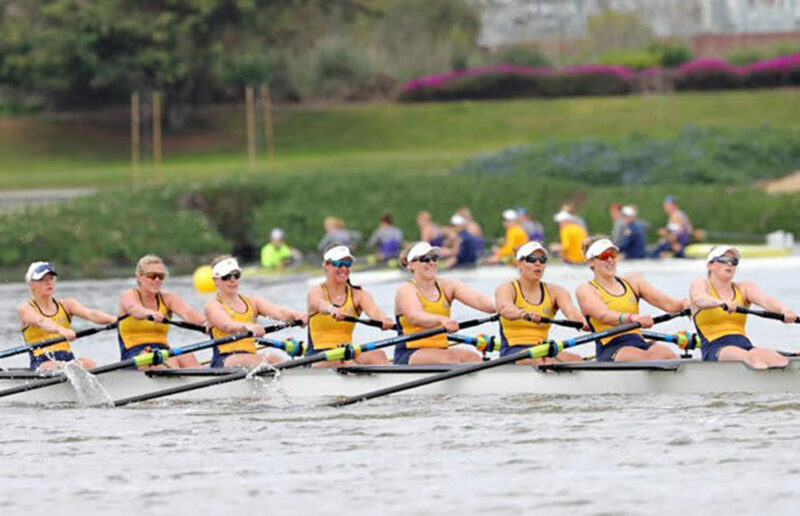 It’s not easy for Cal women’s crew to particularly impress at the Head of the American. There’s quite a billing to live up to when the Bears head down for an early-season tournament that they began this year’s fall season with. Their A team dominates the other team’s best, and their B team holds its own with the other school’s best. It can’t be said whether one first-place finish is better or worse than another, but Cal put up another dominant performance that is sure to not leave too many wanting anything more. It’s become a yearly tradition for a Bear to put her name all over the tournament’s leaderboards and set herself up to be the premier rower of the season to come. This time around, that honor belonged to sophomores Kailani Marchack and Juliane Faralisch. It’s not a particular surprise that Marchack became the rower of the day at the event — it’s undoubtable that she has the pedigree to put up that sort of performance, as she part of the U.S National team that competed in the Junior World Championships in Rio De Janiro in 2014, and in the Netherlands in 2016. In the later event, she placed third in the junior’s 2- event, giving the U.S one of its better placements on the day. She partnered with Faralisch, a member of the dominant German National Team who had accumulated a lifetime of national success before coming to Cal, for the 2-. The duo stole the show with a mark of 19:21.4, two seconds ahead of a second-place team of USC senior Ida Gørtz Jacobsen and junior Krete Koovit. Beating an experienced Trojans team that included USC’s captain (Jacobsen) is impressive enough without knowing that it’s the only team that even sniffed the Bears’ time. Every other team was more than seven seconds behind. Cal’s seven other duos finished in the top 25 of a race with 55 competitors, showing off the kind of depth that it boasted at last year’s national championship. The Bears don’t lack talented experienced faces either, as their second-fastest duo was of senior Julia Vander Hoven and junior Sydney Payne. Perhaps most importantly, Cal was able to avenge its second-place finish last year in the crucial Women’s Collegiate 8+. In a shocking turn, it was Washington’s B team that ended up taking the win in that event, finishing more than a marginal six seconds ahead of the Bears, who had finished a fraction of a second faster against the Trojans. Washington’s B team again placed impressively, earning bronze and finishing ahead of USC. But it was Washington’s A team and the Bears’ A team that were fighting out closely for the top mark, and Cal came out ahead by less than one second. The only event left in the fall for the crew team is a one-off against Stanford in two weeks, and the Bears should certainly be feeling good about the matchup. Cal’s A, B and C teams all finished above Stanford’s lightweight team. It still promises to be a competitive matchup, as Stanford took silver at last year’s NCAA Championships and impressed this week at Head of The Charles Regatta. Due to misinformation from a source, a previous version of this article stated the incorrect year for Roisin Duffy. Due to misinformation from a source, a previous version of this article also stated the incorrect pair that won the 2- event. Due to misinformation from a source, a previous version of this article also stated the incorrect pair that was Cal’s second-best finishing.